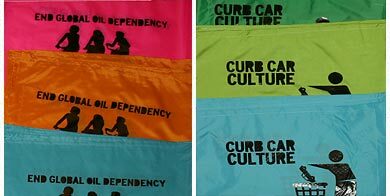 London WNBR has commissioned beautiful brightly-coloured and hand-printed flags, with several different campaign slogans. If we attach them to our bikes, we will make an even bigger impact on the UK's streets. Buy a flag to be mailed to you anywhere in the UK for £3.50 (postage included - provide your own cane). Alternatively, buy your flag online in advance and collect (cane included) at the London, Brighton or Southampton rides.